Measurements: RMS, dc, ac + dc voltageand current peak voltage and current"" real, apparent, andreactive powerharmonic analysis, THD""
The Agilent 6812B is ideal for applications such as power supply testing, UPS testing, avionics ATE, the testing of power factor corrected equipment and devices. Set up is made easy with the Graphical User Interface, which requires no programming. And protect your valuable prototypes and assemblies with the extensive set of protection features. 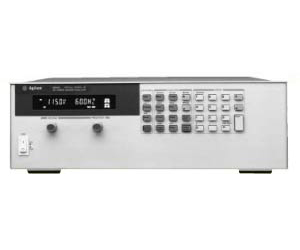 Save space on a lab bench or in a test rack with this flexible instrument, which can take the place of an AC source, DC source, powerful arbitrary waveform generator, as well as a sophisticated power analyzer. An optional second power analyzer is available, which can be used independently from the source, or for dual-node measurements such as power supply input/output efficiency tests.